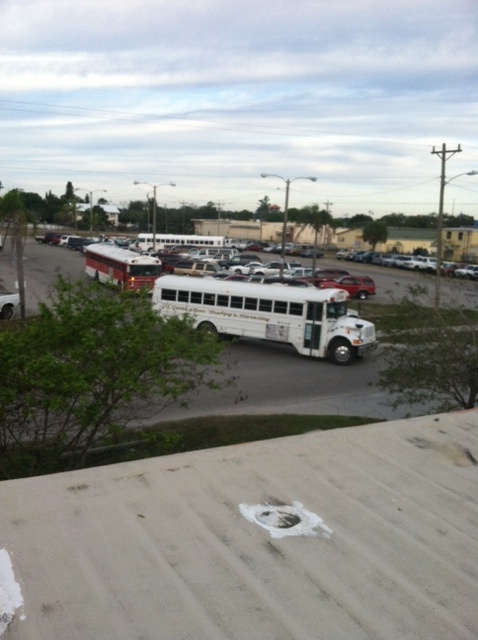 Standing on the rooftop of a one-story building at sunrise, in order to see a bird’s eye view of the small southwestern Florida city that I was visiting, draped in tallit and wrapped in tefillin, I recited the words of our morning liturgy: Baruch Atah Adonai Eloheinu Melekh HaOlam she’asani Ben-Chorin, Praised are You, Lord our God, Ruler of the Universe, who made me a free person. I recited these words while overlooking “the parking lot” that sits at the center of Immokalee, Florida, watching two dozen buses filled with tomato pickers drive away to the tomato fields that surround this small town. modern slavery.” In fact, according to US Attorney Douglas Molloy, anyone who has eaten a winter tomato has eaten a fruit picked by a slave. These migrant workers are enslaved to growers and crew leaders through coercion, force, fraud, and debt. I spent this week on a rabbinic delegation with T’ruah: The Rabbinic Call for Human Rights visiting the Coalition of Immokalee Workers to learn more about the unthinkable reality these workers in the tomato fields face. Many are forced laborers. 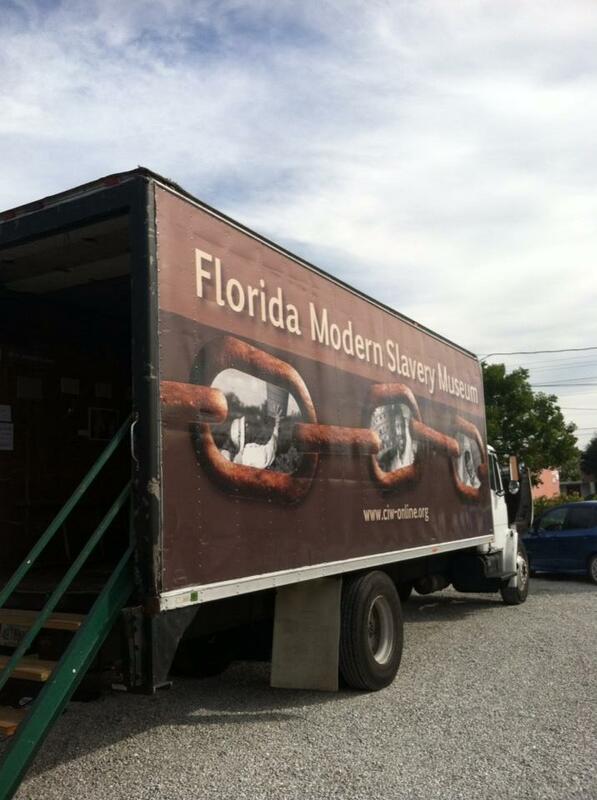 These examples were highlighted during my visit to Florida’s Modern Slavery Museum, which offered a detailed and disturbing description of, among other things, the 2008 case of US vs. Navarrete in which Cesar and Geovanni Navarrete were each sentenced to 12 years in federal prison for beating, threaten, restraining, and locking workers in a truck at night — only showing them the light of day in order to head to the fields in the morning. 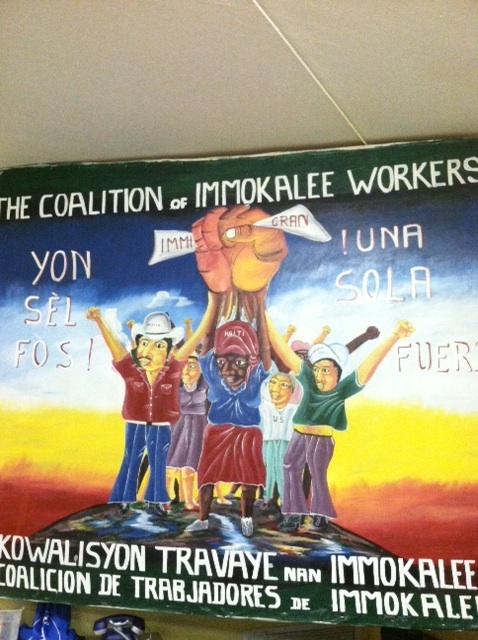 The Coalition of Immokalee Workers was founded over 20 years ago — and continues to be run — by Latino, Haitian, and Mayan Indian farmworkers. Farmworkers were intentionally left out of the National Labor Relations Act, making it possible for me to make a short couple of hours drive across the state of Florida and witness such terrible treatment of workers. For example, the tomato picker has been receiving roughly the same wage — paid by piece — since 1978, being paid approximately 50 cents for a 32 pound bushel of tomatoes picked. To put this into perspective, buying the same 32 pounds of tomatoes in the supermarket costs the consumer roughly $81. A picker would need to pick 153 overflowing bushels to just make minimum wage. The CIW explains: slavery is the extreme end of a continuum of abusive and exploitative labor practices. As an organization, they have worked to changed such exploitative labor practices and in doing so, have freed thousands from a path towards slavery through their Fair Food Program. This Shabbat is Shabbat Shira, the Sabbath of Song, as we read aloud the text of Exodus Chapter 15, the Song of the Sea, celebrating the Israelites’ journey from slavery to freedom. I gathered with other rabbis from the T’ruah delegation for a public action this past week at a Publix Supermarket in Naples, a short drive from the tomato fields of Immakolee. Singing the words of the Song of the Sea in the fruit and produce aisle, we encouraged the stores manager to speak with headquarters about the Fair Food Program. Other corporations, including Taco Bell, McDonald’s, Burger King, Subway, Chipotle, Aramark, Trader Joe’s, and Whole Foods have all signed on to the Coalition of Immakolee Worker’s Fair Food Program. They have done their part to eradicate modern-day slavery. Publix, the largest supermarket chain in Florida, strives to be the premier quality food retailer in the world, to be dedicated to Dignity, Value, and Employment Security among its Associates, and to be involved as Responsible Citizens in our Communities. Yet, Publix has refused to even sit down with the CIW. This is not a labor issue. This is not an altruistic issue. This is a human dignity issue. In the Babylonian Talmud (Tractate Shabbat 54b) we learn “anyone who is able to protest against the transgressions of one’s townspeople and chooses not to, is punished for the transgressions of the townspeople; anyone who is able to protest against the transgressions of the entire world and chooses not to, is punished for the transgressions of the entire world.” If we do not stand up, if we do not step up, if we do not act and make our voices heard, then it is as if we are the taskmasters, we are the crew leaders and growers who continue this endless cycle of slavery. Pirkei Avot 2:5 (The Ethics of our Sages) teaches us: Al Tifros Min HaTzibur, that we must not separate ourselves from the community. The successes of our neighbor are our successes. So too, the hardships of our neighbors are our hardships. So as we prepare to sing and celebrate the freedom of our own people, let us continue to fight for the dignity of all peoples. I davened in a church once. I don’t mean prayed during church services; I mean I actually davened there, with a group of fifty Jews, each with a siddur, in hand, reciting the fixed liturgy of the afternoon Mincha service. This wasn’t a church that housed a synagogue on Saturdays; this wasn’t a church that a synagogue rented space from; this church was solely a church. It may have seemed off or strange to an outsider looking in, but it made sense to us. My last summer serving as a group leader on the USY on Wheels cross-country teen tour, together with fifty teenagers, the group was passing through Birmingham, Alabama. We stopped in at the Sixteenth Street Baptist Church, the site of the horrific bombing on September 15, 1963. This center for civil rights rallies during the spring of that year was bombed by members of the Ku Klux Klan, killing Denise McNair, age 11, Carole Robertson, age 14, Cynthia Wesley, age 14, and Mae Collins, age 14, as well as seriously injuring another 22 children, all there for Sunday School class. Why were they victims? Because of the color of their skin. In fact, the governor of Alabama at the time, George Wallace, said that the only way to stop integration was to have much needed “first class funerals.” This group of teenagers, this group of USYers, couldn’t believe it. They originally entered the building with apathy, more interested in flirting with their friends than in why they were there. Yet, when they heard the story of this tragedy, many were brought to tears. The group insisted that we could not leave this space without saying Mourner’s Kaddish, acknowledging the innocent lives lost half a century ago due to racism, hatred, and bigotry. So we remained there and davened, concluding our service with the Kaddish. 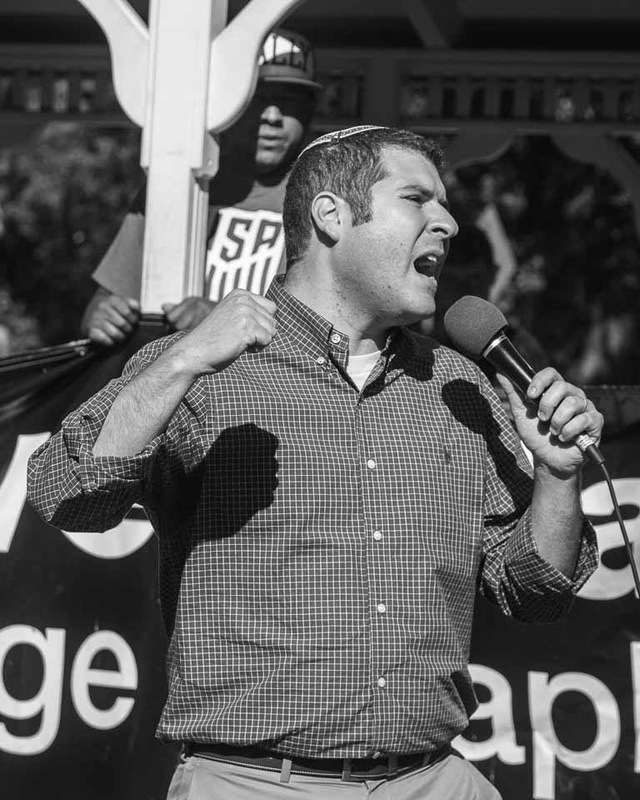 This example of a Jewish group rising up, want to do something – anything – is just another example of the Jewish community’s involvement and connection to the Civil Rights Movement. Like 55 years ago, when the Hebrew Benevolent Congregation, otherwise known as the Peachtree Street Temple, a large Reform synagogue in Atlanta was bombed with fifty sticks of dynamite tearing the walls of the building. Why? Because the synagogue’s rabbi, Rabbi Jacob Rothschild, was an outspoken advocate of civil rights and integration and a friend of Martin Luther King Jr.
Of course, let us not forget about Rabbi Abraham Joshua Heschel. Rabbi Heschel, who came from a Hasidic family in Warsaw, Poland, and quickly became captivated with the Reverend Dr. Martin Luther King Jr., an African-American, who grew up in a Southern-Baptist home in America, because of his use of Torah, using the scripture of the Hebrew Bible and specifically, the books of the Prophets, to advance the cause of civil rights in this country. The famous image of Heschel and King, praying with their feet, still resonates with us to this day, walking arm and arm, marching for civil rights from Selma to Montgomery, carrying a Sefer Torah along the way as a reminder that our scriptural core, that the words of our tradition, that God’s word, reminds us to pursue justice, to fight for equality, to love thy neighbor as thyself. That hope was what carried Martin Luther King Jr. through the challenges he faced, through his uphill climb during the Civil Rights movement. That hope is what leads all of us to believe that despite whatever darkness resides in the world, it will get better. That hope is what led Reverend King to teach: “Darkness cannot drive out darkness; only light can do that. Hate cannot drive out hate; only love can do that.” So, the Jewish community continues to fight for justice, for equality, for civil rights. The RAC, the Jewish community’s Religious Action Center, which lobbies to make real legislative changes in Washington, defines Civil Rights as “the non-political rights of citizenry. In the United States those rights are guaranteed by, among other means, the 13th and 14th amendments to the Constitution. More broadly, however, civil rights refer to all those rights that allow a citizen to fully participate in civic society.” They add that “the struggle for civil rights is a struggle to achieve equality of opportunity for all, regardless of race, religion, national origin, gender, sexual orientation, gender identity or disability.” We understand that struggle. We read of that struggle in our Torah, for we were once strangers in a strange land, fighting for freedom, fighting for equality. That is why this fight is also our fight – and this fight is far from over. That is why the Jewish community must continue to be involved in the fight for justice. I was actually quite surprised to find out that the Jacksonville Jewish Center has never participated in Jacksonville’s Martin Luther King Day Parade that encourages contemplation, introspection, reflection, and celebration – celebrating Martin Luther King Jr.’s life and legacy as well as committing to carrying on his legacy. In fact, I was shocked to learn that no synagogue, Jewish school, agency, organization, or institution has ever marched in Jacksonville’s annual Parade. That is about to change as the Jacksonville Jewish Center will be marching together Monday morning in the MLK Day Parade. This is because we honor Dr. King’s legacy and acknowledge that we, as Jews, have a responsibility to celebrate civil rights, and to not stand idly by while still far too many in our world, in our country, in our own backyard are discriminated against. We will participate in this parade because we will be praying with our feet like Heschel and King, and we will be standing up for others, like we find in Parashat Bo. In Parashat Bo, we are introduced to Pesach, to the Pascal sacrifice, and to the famous account of putting the blood of the sacrificial lamb on our lintels and on our doorposts. Pesach, Passover, refers to the Malach HaMavet, the Angel of Death, passing over the homes that had blood sprinkled upon the doorposts. I learned from my father, Rabbi Kerry Olitzky, the teachings of his teacher, the late Dr. Chanan Brichto, who was professor of Biblical Studies at Hebrew Union College. He taught that we mistranslate the Hebrew word Pasach. Rather than meaning flying over or passing over, it actually means “Standing in the Doorway”, or “Standing in Front of.” The image he describes is one in which God sees the blood on the doorpost and stands in the doorway preventing the angel of death from causing harm. I would suggest that we take the imagery that Dr. Chanan Brichto describes one step further. If we are made in God’s Divine image, B’Tzelem Elohim, and are described in the Torah as God’s Malachim, God’s messengers and angels, then the image of Pesach is not the angel of death passing over our homes and it is not of God standing in our doorways. Rather it is that we are standing in each other’s doorways, protecting each other from hardship, from harm, and from heartache. The image of Passover that was celebrated during the civil rights movement is an image that is about more than just the gift of hope. It is an image that is about standing up and protecting each other, it is about standing in harm’s way to ensure the God-given rights of another. This was a difficult task during the civil rights movement – a task that lead to violence, domestic acts of terror, and murder for the African-American community as well as those in the Jewish community that stood up and stood in the doorway for this moral cause. As long as there are still those among us that in the year 2013 are discriminated against and treated as unequal, then this is also a task that is far from over. So let us continue to celebrate King’s legacy and do his holy work. It is not an easy task, not a simple task, but an essential task. To paraphrase Pirkei Avot, even if King was unable to truly complete the task – to rid this world of hatred and bigotry – and even if we too may be unable to complete the task, we are still are obligated to stand up. So I invite you stand up in the smallest and simplest of ways by joining me and members of the Jacksonville Jewish Center on Monday morning and marching in the Martin Luther King Day Parade, celebrating justice, equality, and freedom – celebrating how far we have come, and understanding how far we have to go. 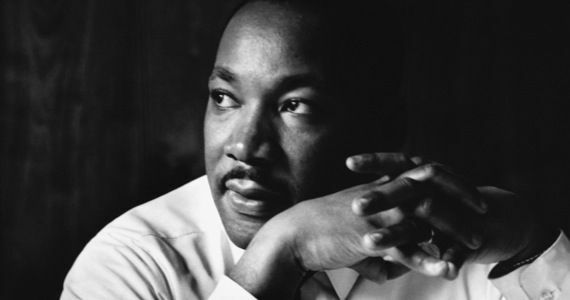 Martin Luther King was famous for among other things, teaching that “the ultimate measure of an individual is not where he stands in moments of comfort and convenience, but where he stands at times of challenge and controversy.” So continue to stand in the doorway protecting all of our brothers and sisters from discrimination. Stand with them. Stand with us. 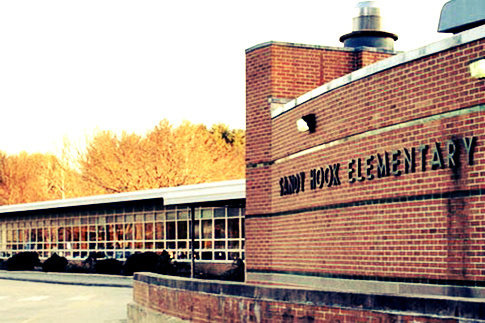 Today, January 14th, 2013, marks one month since the unthinkable happened: the murder of twenty-six, including twenty young children at Sandy Hook Elementary School in Newtown, Connecticut. In Jewish tradition, one month marks the conclusion of the stage of mourning known as Sheloshim, literally meaning thirty, referring to the thirty days of the month. Unlike the initial week of Shiva, Sheloshim is the beginning of a mourner’s return to normal social and professional duties while still maintaining observance of restrictions, prohibitions, and traditional mourning practices. Sheloshim is meant to slowly ease the mourner back into a life of normalcy. For most relatives, Sheloshim ends the traditional formal mourning period. Yet, we all recognize that it is impossible for things to “get back to normal” after thirty days. In fact, those who have grieved and mourned the loss of a loved one understand and accept that life will never again be “normal.” If anything, the end of Sheloshim prepares the mourner for a changed and distinctly different reality. How then are we as a nation supposed to feel one month after the tragedy at Sandy Hook Elementary School? Some of us have moved on with our lives. Some of us have become obsessed with the next headline of the day. However, I am still struggling to accept this new reality, a reality in which there are no guarantees, in which there are no “safe spaces,” not movie theaters, not houses of worship, not shopping malls, and not elementary schools. While I struggle to accept this reality, I pray that for the sake of future generations, we can end gun violence. When we recite the traditional words of the El Maleh Rachamim, the Memorial Prayer, we say Ba’avur sh’nadvu Tzedakah b’ad hazkarat nishmato, may we give charity in remembrance of the soul of our departed loved one. However, tzedakah, which we typically define as charity, really means ‘justice.’ Thus, what we really pray for when we recite these words is “may we do justice in remembrance of the soul of our departed loved ones.” I do not know if I will ever truly be ready to accept this reality. I do not know how I will explain this world full of inexplicable acts of violence to my daughter when she is old enough to comprehend the difference between good and evil. Yet, I do know that as we try to comprehend this reality, we must do justice and make real changes, so that these twenty innocent children’s memories remain a blessing. Tomorrow, Tuesday January 15th, Vice President Biden will offer recommendations from the Gun Control Task Force that he led to the President of the United States. We can assume that the recommendations he offers will set potential policy in motion. It is no surprise that our country is divided on many issues. After all, Congress has been in a stalemate for months. According to CNN, over 85% of the country support some gun control reform while a the same time, the New York Times reports that the sale of guns and ammunition has spiked over recent weeks in anticipation of potential policy changes. Some among us believe that we must defend the Second Amendment of the Constitution at all costs while others believe that we should ban all guns from private ownership. As one side goes farther in one direction it seems the other side goes farther in the other direction, leaving all parties far from a middle ground in which we can all agree on. True justice, the tzedakah that we pray for, involves our country, its citizens, politicians, and special interest groups putting their own agendas aside for the betterment of all. My hope and prayer is that with true justice, by making our voices heard and by taking action, by demanding a plan, we can end gun violence. Maybe then, I will never have to explain to my daughter about evil and violence for together, we can work to rid this country of such violence. Our Sheloshim may be over, but our mourning, our grief, our tears, and our heartache remain. Let us change our ways so that we can learn to heal and do not have to mourn another innocent life murdered in cold blood. Psalm 30 teaches us “at night we may cry ourselves to sleep, but joy comes in the morning.” I, like so many, still cry for the twenty-six innocent lives murdered in Newtownm Connecticut one month ago. I await that new day, that morning in which we can celebrate with laughter instead of mourn with tears. I pray that through our own action, that new day will come soon. May the memories of all those innocent victims taken from the world far too soon forever be for a blessing. Amen.